Another important aspect of the Master is it does not need to install MongoDB nor ActiveMQ for internal management as everything is stored in etcd. 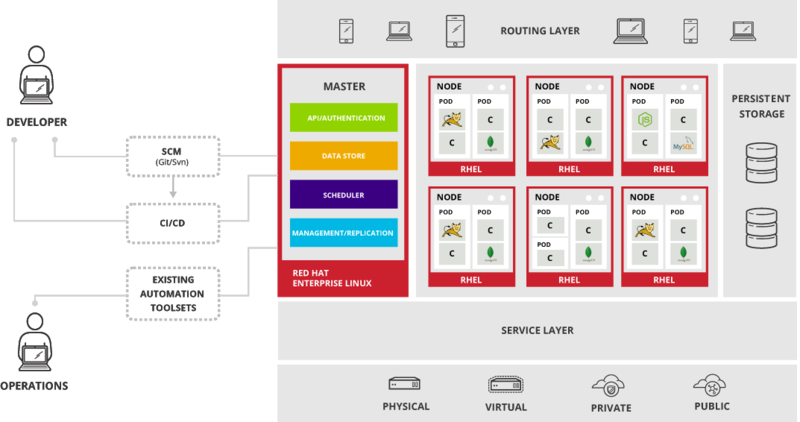 The main component of OpenShift, but with many definitions depends on who is talking about “application”. It does not means the same for one person as for other. In OpenShift v3 we can deploy as many components as we want, contained in a project (lets talk later about this) flexibly linked together, and optionally labeled to provide any groupings or structure. This new model allows for a standalone MySQL instance, or one shared between JBoss components, or really any combination of components you can imagine. Thous the application code is decoupled from the libraries and binaries needed to run. Policies: rules for which users can or cannot perform actions on objects.